Etekcity Stove fitting in the pocket. 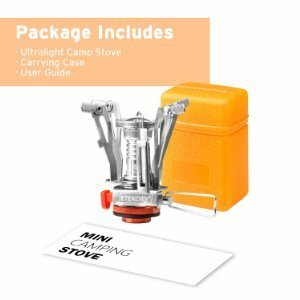 Etekcity Ultralight Portable Camping Stove with piezo ignition is a wonderful small tool, ideal for backpackers, hikers, and mountaineers. The stove comes with a nice carrying case, so small that it fits into your pocket. As the name suggests, you do not need a lighter or matches to ignite this stove. The stove is made of aluminum alloy and stainless steel, with a compact and collapsible design. 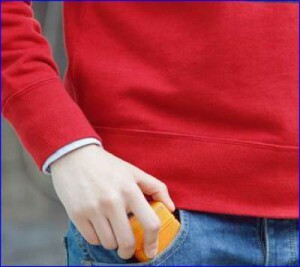 It is strong but very light, ideal for ounce-counting backpackers and hikers. It is compatible with all 7/16 thread single butane/butane-propane mixed fuel canisters. 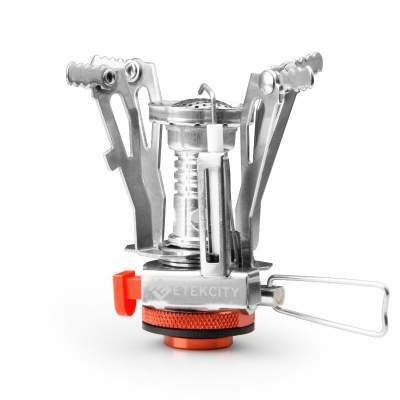 Etekcity Ultralight Portable Camping Stove. The most important elements of the stove. The design is very fuel efficient. You have 4 foldable anti-slip arms, which provide a good support for up to 7 inches (18 centimeters) diameter pans. You can see it on the right. Weight: 3.2 oz (91 g). Size: 3.15 x 2.36 x 1.81 in (8 x 6 x 4.6 cm). Output: 1.680 kilocalories /1.94kW/6.666 BTU. Ignition: built-in electric spark ignition system. The words Piezo ignition in the title describes the fact that you do not need matches or lighters. If you have a bit if experience in outdoor cooking, you will know how annoying it can sometimes be to start a gas burner in windy conditions and at high altitudes. With this mechanism, this is far easier (when it works, but see the cons below). You will be surprised when you receive your ordered package. The design of this burner is exceptionally clever and it fits into a very small plastic carrying box which you will use to carry the burner in your backpack. It is of the size of a double cards package. You can see it in the picture on the right. The arms are too small for larger pots. Rotating the legs back, to store the tool in the box, can become tricky. The number of reports from Amazon users is enormous. 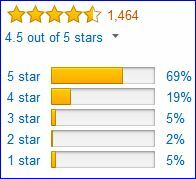 The stove has received a very high average rate by Amazon customers, 4.5/5, based on more than 1400 reviews. I always read first those with the lowest rate. So yes, there are many complaints indeed, as well as many great words about this tool. But this seems to be the case with every piece of equipment which you search for on Amazon or elsewhere, even with the most expensive ones. You will find complaints even in the case of the award-winning MSR PocketRocket 2 stove. I guess the difference with Amazon, as compared with others, is that Amazon really allows for negative comments on the products, so you can get a more realistic picture about an item. 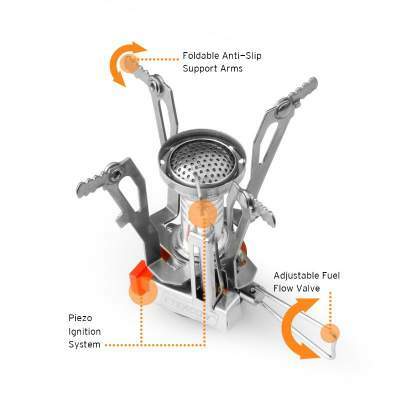 The Etekcity Stove comes with great features, my rating in all criteria is very balanced so the average rate is very high, it is higher than the MSR Pocket Rocket 2 stove and this is mainly due to its incredible price. Etekcity Ultralight Portable Camping Stove with piezo ignition is a nice small tool that will fit in any pack or in your pocket. I do believe it is worth the money, but like with any other piece of equipment, test it before you set off for a tour. Be careful in the process of screwing it on the gas bottle, do not press the ignition button accidentally. I see Etekcity as a nice tool to be used in camp together with the far more powerful solar stove. Thank you for reading, I hope the text has been useful, if so please share it with others. I shall be happy to have some comment from you. If you have been using this tool then let us know about your own experience with it. Have a nice day. Does the Etekcity have a field service kit available like the MSR Pocket Rocket? I always take the field service kit with me on long multi-day backpacks. 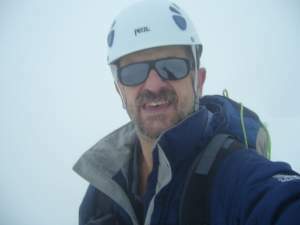 I’ve had my MSR get clogged before in the holes that the flame comes out of, and have to be cleaned in the backcountry – or I didn’t eat. Also, any stats on it’s cold weather performance and what temps it’s rated down to? I described in the text what the package includes. I did not see them selling the kit separately. Regarding the cold weather, generally this piezo ignition is more reliable than matches and lighters. But more important issue in cold weather is the fuel you use. I discussed this in my another text. So here a few words. At low temperatures propane-butane mixture burners may work but only up to some point. Butane alone will not work properly if it is very cold, roughly speaking below -1°C. For such temperatures it will not turn gaseous. To be sure you have a proper tool, you will use propane alone. This is because propane can turn gaseous for very low temperatures, as low as –41 °C. Thanks for the review on the Etekcity Ultralight Portable Camping Stove. I’m not sure whether it is a backup or a real piece of kit. I think as a backup it is perhaps perfect. And for the price it’s hard to argue with my guess is the gas will cost you more. Do you have any other reviews for larger gas cookers? Hi Donald, it is real. You have seen how many people at Amazon reported about it. Presently do not have reviews about larger cookers.